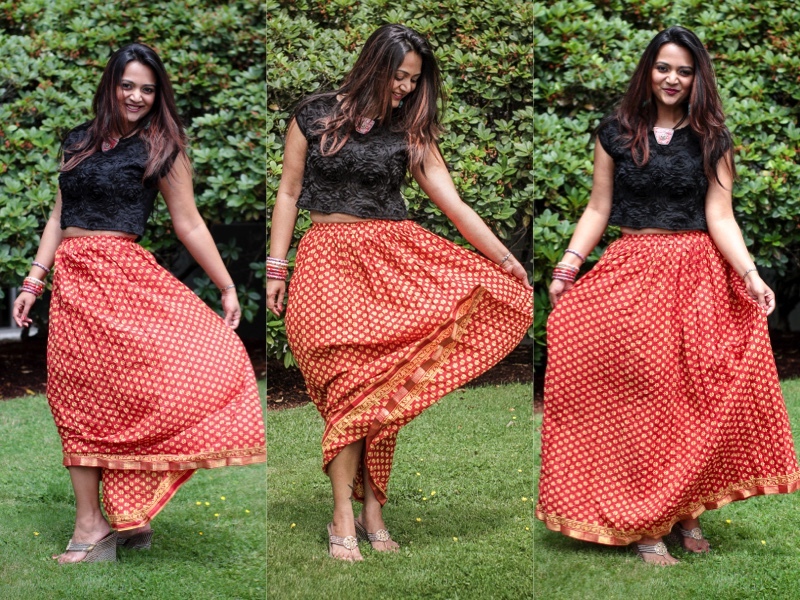 Today's post is all about the trending 'Maxi Skirts'. Maxi Skirts need no introduction and am sure each girl has one in her wardrobe. Maxi Skirts are usually slightly fitted and flare out to floor length and sometimes are shorter and just reach your calf. Maxi skirts are simple pieces which need to be styled well. You find maxi skirts in different colors and patterns. They vary in lengths and are made of different fabrics ranging from chiffon, cotton to silk. I have worn maxi shirts in plain solid colors in the past but for the year 2016 what's trending is Maxi skirts with ethnic prints. They are versatile pieces which if paired well can create a style statement. I received this beautiful brick red maxi skirt from ezebee.com. What I love about this skirt is the beautiful bold color and small yellow prints and the delicate details at the end of the skirt. Floor length skirts are always a good option to add height to your frame if paired with a solid color top and works even better with a crop top. 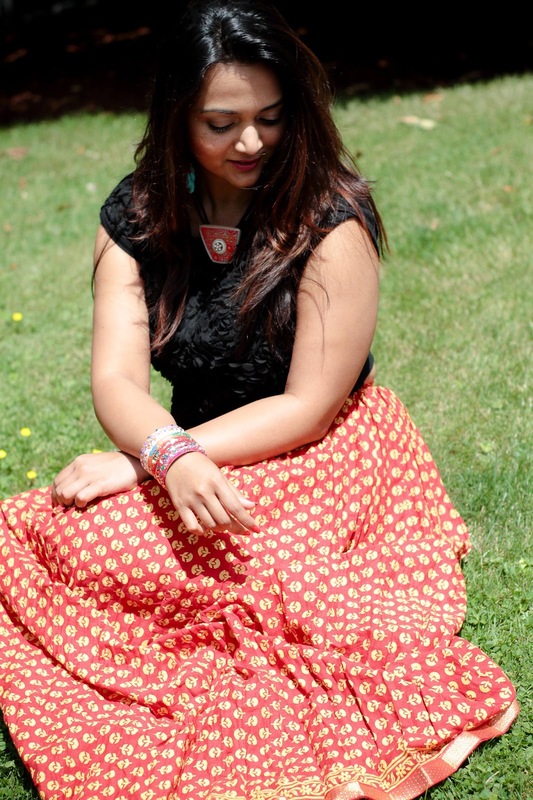 The ideal combination for this maxi skirt was a yellow crop top for a more fun vibrant look. But since I wanted to accessorize I chose the classic black lace crop top. For those lazy summer days when you don't wish to or have time to shave your legs, a maxi skirt can save your day . 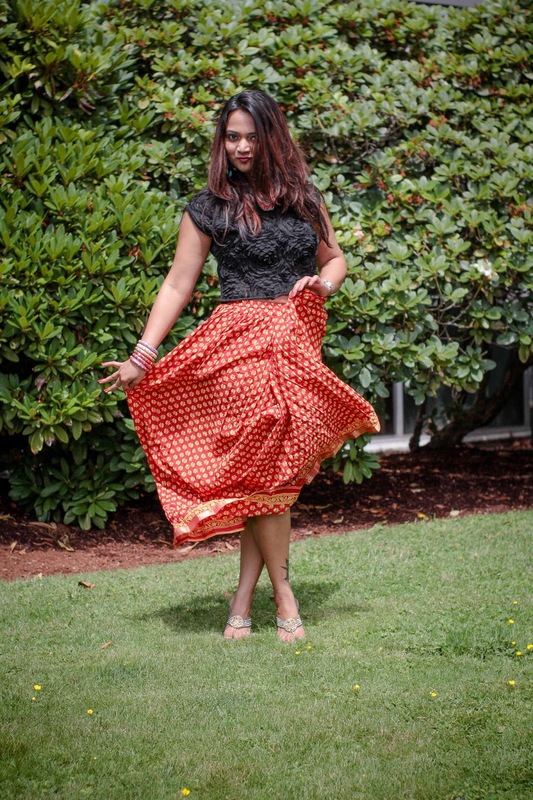 The Maxi skirt with small prints are ideal for bottom heavy/pear shaped women. 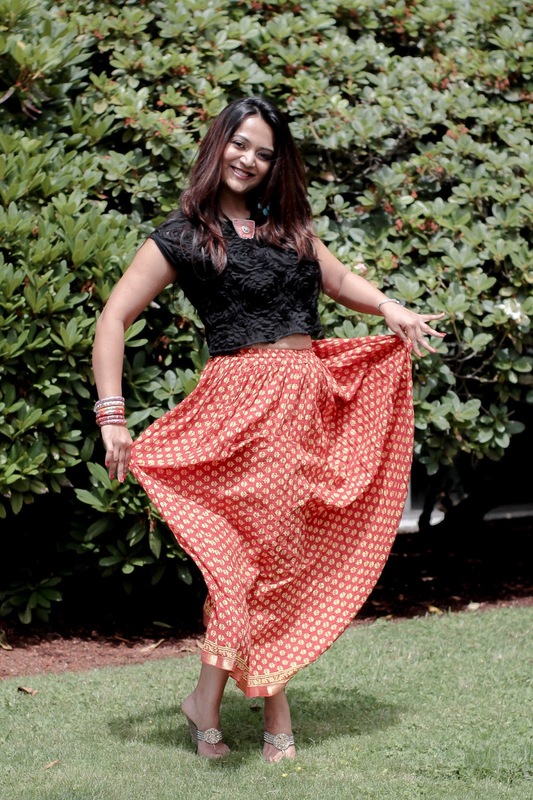 If you are worried about the winter weight then maxi skirts are best options for hot summer days. I always pair them with wedges or heels that add some height. The newer better easier ezebee.com website is so user friendly. Even though they have extensive collection of products its really easy to navigate and find what you are looking for. You should also check their Facebook page and Instagram account for more ! Let me know your thoughts. 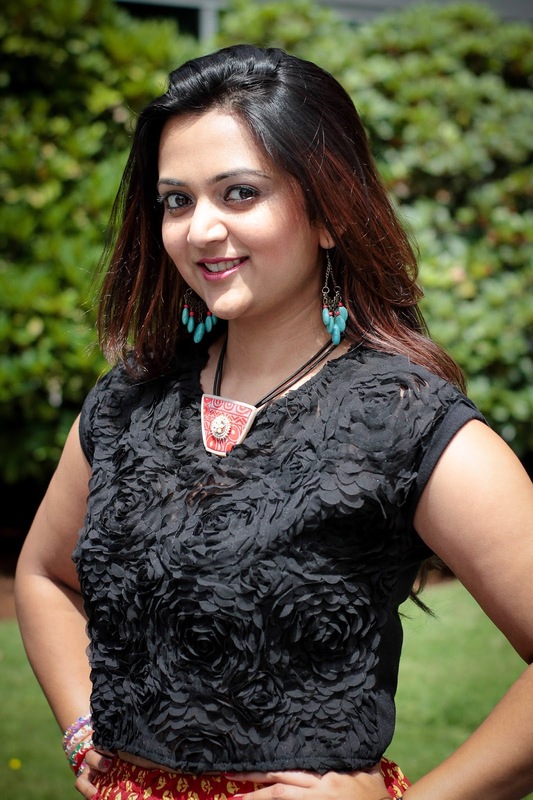 The jewelry I am wearing is handmade by a artistic and creative person called Archana Chandrasekaran and more details regarding that will be shared in next post. Until then ... Stay Stylish ! Lovely skirt. It looks beautiful on you! love the detail on your top. Have a great week. I look so cute n the skirt is pretty. cant tell u in words how amazing you look. Ethnic is you thing baby. Anaya this is such a pretty skirt ! What a lovely print. Love the maxi! Such pretty colors. Very beautiful dress. I will prefer it for my girlfriend.